Don’t be intimidated! You can totally do this!! Here are all your random parts from the list . . . let the building begin! First, make 3 of these upside-down “T”-shapes using 1 5-foot (1/2″) pipe, 2 1-foot (1/2″) pipes, 1 tee, and 2 end caps. At the top is your male adapter. Build one more upside-down “T”, only this time you will use one end cap and one hose adapter. At Home Depot, they were sold out of the right size of hose adapter, so we had to purchase an extra piece so that our hose adapter would fit. However, we later found the correct size hose adapter at Lowe’s (after this picture was taken), so you won’t have this extra piece like we do! (Pictured is a 1/2″ to 3/4″ female adapter in the middle and a 3/4″ to hose male adapter). Prime your pieces and cement them into place!! Now with your 4 (3/4″) pipe pieces, drill random holes in the pipe. We kind of had our holes staggered so that the water would shoot out at different angles. We also made our holes different sizes. Now piece your 4 (3/4″) pipes (with holes drilled in them!) together with the threaded side outlet elbows (1/2″ threading should be up). Holes that you drilled in the pipe should be angled slightly in (towards the center) to ensure maximum soak-ability! After the cement is dry, all you have to do is screw in the four “T”-shaped legs to the top (securely) and plug in a hose to the adapter on the bottom. Turn the hose on as high as you can for the strongest water-stream. camille! I love this! What a fun idea! I will have to make one of these! Av would love it! Bryn is so cute! I love her swim suit too! Thanks for sharing! So fun! Reminds me of our homemade slip and slide we had when I was little! ha! That is such a GREAT IDEA! Love it! oh my goodness what a cute idea! looks like so much fun! It's a weekly child centered linky party I co-host every week. We are oepn for links from Sat night thru Thursday! Hope you stop by to share. Our companys products are Sprinkler Pipes, PVC pipes, PVC riser pipes, PPR pipes, PEX Pipes, PPRC Pipes, PVC column pipes, PVC plumbing pipes, UPVC pipes, & Water Storage Tanks and All type of pipes fitting, Supplier, Wholesalers, exporters & manufacturers in India. This was really a great and innovative idea Camille. This DIY project sounds really good and i will implement it soon. Thanks for this share and awesome blog. We made one of these last summer. It was a hit. 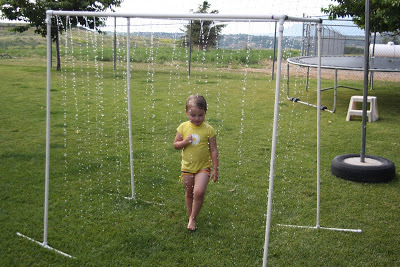 I love this idea, but instead of drilling holes in my PVC pipe that I am constantly using for a variety of projects, I am going to attach a sprinkler hose to the top of the kid wash.... I hope it works! Thanks for the great idea! This is so awesome! I got your cook/craft book at Costco and looked this up online to see the comments. Do you have to cement the pieces together? I'd like to be able to take it apart but I don't want the water to leak. Also about how much does this cost to make? Thanks. I'm so existed to try this and love the book! The project cost about 20 dollars to make. You do need to cement the pieces together to keep it from leaking. Your kids will LOVE it! How do u store it for the winter? We are able to break it down into 2 big pieces and we store it in the garage against the wall. You can always re-glue it each summer. This is our 3rd summer with it and it works great! Hope this helps. How much did this while project cost? The total cost was around 20 dollars.